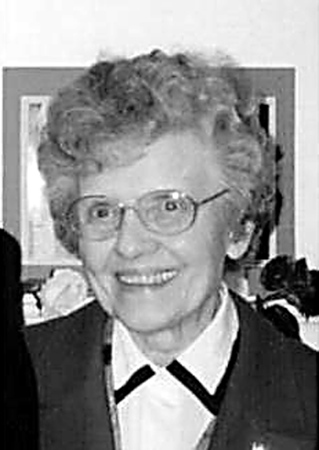 Anne W. (Walincius) Kelly, 92, of Berlin, died Saturday afternoon at home. Born in New Britain, the daughter of the late Andrew Walincius and Anna (Jevaisis) Walincius, she lived most of her life in New Britain, moving to Berlin in 2007. She was a lifelong parishioner of St. Andrew's R.C. Church in New Britain, a member of the Choir, Rosary Society, and many other church organizations. Proud of her Lithuanian Heritage, in 1996 she was honored as the Outstanding Lithuanian Woman of the Year by Pasaulio Lietuvi¬ų Bendruomenė (PLB) and the Lithuanian World Community, Chapter 20; and in 2010, she was honored by the Board of Governors of Lithuania American Community, Inc. for her lifelong promotion of Lithuanian Culture. She was a double Brownie Troop Leader, a Cub Scout Den Mother and volunteered for many years at the Red Cross Blood Drives. An accomplished seamstress, she sewed costumes for the New Britain High School Annual Review and for the St. Andrews Church Choir Shows. Affectionately known as "Ma Kelly" by all, she volunteered for three decades at Berlin High School - designing and sewing thousands of costumes for the Annual Spring Musical, Senior Class Plays and the Madrigal Singers in addition to fitting and repairing the Band Uniforms. Anne is survived by her children, James Kelly and his wife, Karen, Robert Kelly, Brian Kelly and his wife, Susan, Patricia Cote' and her husband, Christopher - with whom she made her home, and Andrew Kelly and his wife, Cheryl; her grandchildren, Aaron Kelly, Jonathan Kelly, Sarah Kelly-Lavoie, Justin Cote', A.J. Cote', Robert Cote' Samantha Kelly and Drew Kelly; her great grandchildren, Briana Lavoie and Camden Lavoie, and several nieces, and nephews. She is also survived by three wonderful caregivers, Patty, Deborah and Kate. In addition to her parents, she was predeceased by her husband, James J. Kelly, her sister, Eva Walincius and her grandson, Shawn Kelly. The family wishes to express their heartfelt appreciation to the Berlin VNA, Companions & Homemakers and VITAS Healthcare. Funeral services will be held on Aug. 3 at 9:00 a.m. from the Farrell Funeral Home 110 Franklin Square, New Britain, Conn., with a Mass of Christian Burial at 10:00 a.m. at St. Andrews Church 396 Church St., New Britain, Conn. Burial will follow in St. Mary Cemetery, New Britain. Visitation will be Thursday, Aug. 2 from 5:00 - 8:00 p.m. In lieu of flowers, donations may be made in Anne's memory to The Salvation Army, 78 Franklin Square, New Britain, CT 06051. To send a condolence to the family please visit www.FarrellFuneralHome.com . Posted in New Britain Herald, on Tuesday, 31 July 2018 18:58. Updated: Tuesday, 31 July 2018 19:01.